Researchers have demonstrated the first logic circuits made from molybdenite, a naturally occurring compound made of molybdenum and sulfide (MoS2). Efforts by researchers show the material can not only replace silicon in electronics, but may also improve upon graphene, the well-known wonder material and long-rumored successor to silicon. Silicon has been made ubiquitous by the technology industry, becoming the lynch-pin of all microelectronics. Silicon is both practical and effective in ways that few semi-metals are, making it the ideal choice for microprocessors, or more specifically, transistors. 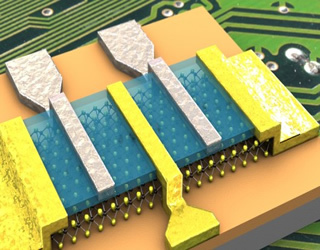 However, in an age where ever-shrinking processors are fabricated using a 22nm process, silicon is thought to be nearing the end of its usefulness due to physical limitations. The more logic gates shrink, the fewer silicon atoms must be used and the more susceptible they become to leakage, signal interference, oxidization and a myriad of other potential issues. This is where graphene comes in. Graphene, an allotrope of carbon that is merely one atom thick, has been considered a break through with many uses. Because it sports many favorable properties, researchers have long been touting the material as a replacement for silicon. Transistors made with the material operate at much higher speeds, can be much smaller and withstand high temperatures without ill effects. Despite all the great things there are to say about graphene though, "graphene's properties are very sensitive to its environment," as one IBM researcher put it. Although molybdenite and graphene share a number of similarities, molybdenite has one key advantage over graphene -- a naturally occurring band gap. Band gap is one thing that makes silicon so useful today. By utilizing this property, silicon can easily flip between conductive or non-conductive states (ie. 1 and 0). This allows it to work perfectly for logic gates. As it turns out though, Molybdenite has a natural band gap suitable for electronics as well. Graphene, on the other hand, requires complicated techniques to achieve a similar effect. Will molybdenite be the future? It is difficult to say. "There are still many questions, like how to grow this on a large scale," said Andras Kis, lead researcher of the team investigating this material. "There's a lot of exploring still to be done with molybdenite."